This item is now available at my Etsy store. You don't have to be a PayPal user, you may use Credit Card for payment. I thought I would create a pair of earrings - but soon I realized I could not re-create an identical side for this, hence it is a pendant now. Materials - Different gauges of Stainless Steel Wires, hence it will not tarnish. Fresh water pearls were in used, and tiny copper beads are surrounding a 4mm sparkling silver color copper bead at PIPA's central. 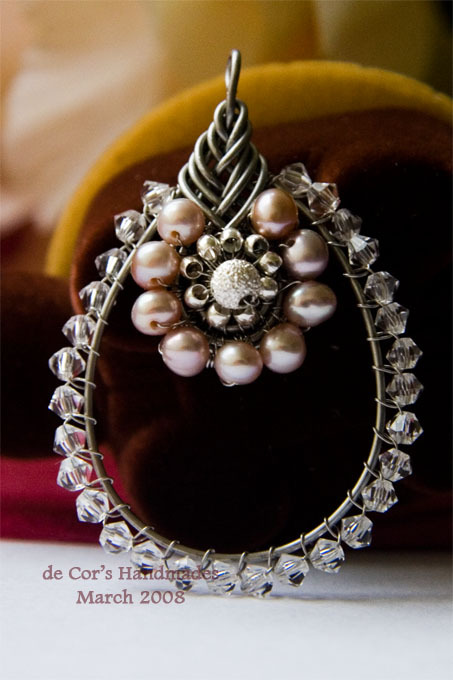 I attached clear Swarovski Crystals by implementing Skylark Knotting for the outest layer of this PIPA pendant. This piece is 4.5cm tall from the hoop, 3.3cm at it's widest measure, weigh 3.5gram. Limited Edition - by Corra @ de Cor's Handmades, March 2008.